Young adults today want very much to make a difference in their communities and help others more than we give them credit for. Cathy McLeod, is one of those young adults striving to drive change. As Miss Black Teen Louisiana—US Ambassador (MBUSAM), she is not the average 18 year old high school senior. The winner of the MBUSAM pageant enjoys seeking out ways to help her community. “Contrary to other pageants, this pageant is based on community service, and actually being an agent of change in the community . . . [it] has given me a platform to express my viewpoints demonstrate my talent and showcase more than just a pretty face,” said McLeod. More than her pretty face is her beautiful mind and spirit, and it is evident in her work. McLeod has taken on a few projects as Miss Black US Ambassador. She launched a non-profit mentoring organization called A.B.L.E, Ambitious Beautiful Leaders and Excellent. This organization was developed to help young women, aged 9 to 19, to find the courage to “stand in the face of diversity, and make a difference by promoting excellence in the world around us,” as the A.B.L.E mission statement declares. McLeod encourages our young women to pursue their dreams and help to create pathways through adversities to accomplish them. There are a few challenges with the organization that McLeod confesses: making the organization well known to potential participants, obtaining funding, and searching for speakers to volunteer for events. The hope is that with more exposure, A.B.L.E will attract those who want to help. An empowerment mini-seminar was held in April 2015 to gather ideas and to create steps toward resolving these challenges, they discussed the struggles of being a Black female growing up in our communities. The seminar became a mentoring session, with conversations about how young Black women are tempted to participate in situations that can cast a negative shadow over our works and accomplishments. In June, her plan is to have a spa day, or pampering session for the girls of her organization. In April 2015, she helped organize a step show with the program High School to College, Inc. High School to College, Inc. encourages high-schoolers to get engaged in college functions and activities so that they will want to pursue higher education. The step show allowed the attendees to meet with sorority and fraternity members, see parts of college culture, as well as how the campuses function. Step teams from some local high schools as well as the fraternities and sororities from Louisiana State University, Southern University, and University of Louisiana at Lafayette were present. The event was so successful that she wants to do it again. The specifics of the next event are hazy, but it is to take place in Little Rock, AK. The passion for her community is fierce, and is the reason why she eagerly chose MBUSM to be her pageant. McLeod is frequently asked the question: Why would you want to be Miss Black Louisiana? But her answer is to shout the question, Why wouldn’t I? She explains, “Other pageant systems such as Miss USA/United States don’t go into the Black communities and put on programs. They don’t advocate for civil rights and fair justice in my community . . . .” She makes it clear that we wouldn’t see these pageants or their participants battling for change in Black communities, which is what makes the MBUSAM organization so different, and her choice of pageant. Aside from her ambitious goals of working within her community, McLeod is enjoying new freedom of graduating from Zachary High school. When she wasn’t conducting seminars or organizing shows, she participated in the usual fun things like dressing up for her senior prom, hanging out at the mall, or catching a movie with her friends. She’s already received local recognition for being in Zachary High School’s DECA program. The club received a grant to help boost student interaction with businesses and earn internships. Aside from her philanthropic and academic success, this 5’5 beauty has remarkable athletic abilities. 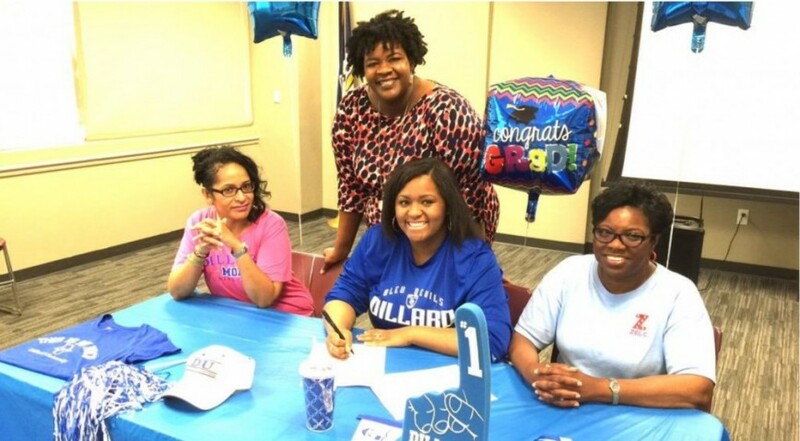 McLeod was recently awarded a scholarship to Dillard University for her outstanding skill and ability in shot put in track and field. On her off season in track and field, she began to lift weights. She did so well that she became a member of the “300 Club,” possessing the ability to lift 300 pounds. In attending Dillard University, she plans to double-major in political science and mass communications. Her desire is to be a “modern Nancy Grace,” providing legal commentary on television. There aren’t many Blacks on television in a positive light, and she wants to fill that void, as well as help others fill those spots. Cathy McLeod hopes to, in some way, touch everyone she comes into contact with. She says, “It doesn’t matter what you do just make sure you love what you do. Do what you love to do and give your best; whether it’s a job, a sport, whatever it may be, give it your all.” She’s living up to those standards and rising to the challenges that come with reaching those goals. Her experiences and projects with MBUSAM, A.B.L.E., track and field, and College, Inc. are preparing her for such success. This shouldn’t be the last we’ll be hearing from Ms. McLeod—don’t touch that dial, she’ll be creating rave reviews with her accomplishments.